December 6, 2012 by Ken Ward Jr.
On Friday, November 30th at approximately 12:15 p.m., a massive failure of the upstream face of the saddle dam for the Nolans Run Slurry Impoundment occurred at the Consol Energy, Robinson Run No. 95 Mine. A section of the saddle dam measuring approximately 650 feet long, 20 to 25 feet above the water’s surface, and 70 feet back from the water’s edge, broke and slid into the impoundment. Four miners were working in the saddle dam area when the failure occurred. 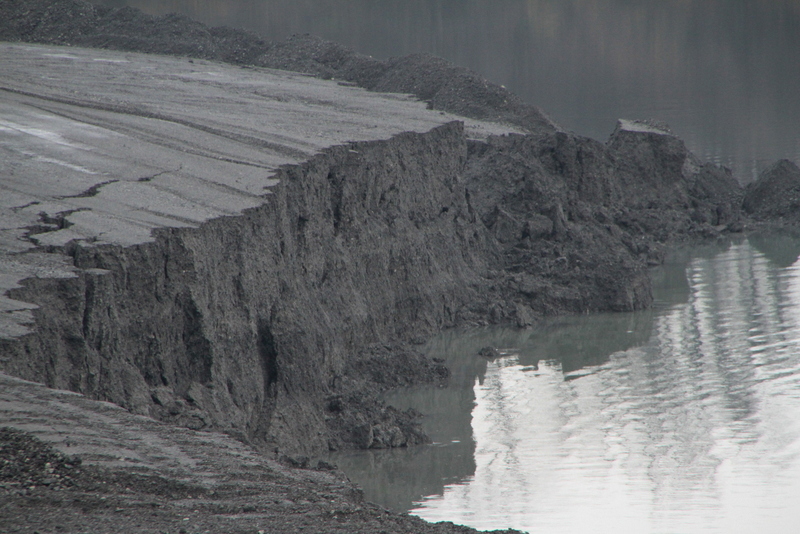 Three of the miners and their equipment were swept into the impoundment. Two miners were standing near the face of the saddle dam looking over and recognized a failure was about to occur. They began to run but were pulled into the water. One of these miners swam to shore and the other was located and rescued by Nutter Fort Fire and Rescue. One bulldozer operator working nearest the face was inside his equipment when it slid into the impoundment and remains unaccounted for. The other bulldozer operator was further back from the face area and was not affected by the failure. Recovery operations are ongoing. The miner’s name has not yet been released, at the family’s request. This is the 19th U.S. coal-mining death so far in 2012. West Virginia leads the nation with 7.